Federal - Greek Revival, one and a half story Cape style house. Projecting front entry porch. This home may be earlier than 1820 and modified over time. It is said that the rear ell on the east side was added in the 1880's. The side entrance porch was added during the Batchelder ownership. A new family room addition off the back was done by the Sawins. Paul Hunt was born July 19, 1753 in Tewksbury, MA, son of John & Lydia (Thorndike) Hunt. Paul, a Cordwainer (shoemaker), is a Veteran of the Revolutionary War. Paul married Sept. 27, 1780 to Elizabeth Shattuck, b. Sept. 2, 1760 dau. of Joseph Jr. & Anna (Johnson) Shattuck. Paul & Elizabeth had four children; Elizabeth b. July 13, 1781 - d. Apr. 22, 1782, Paul Jr. b. July 24, 1783, John b. Feb. 1, 1786 and Elizabeth b. Aug. 2, 1789. Paul & Elizabeth became members of the South Parish Church on September 16, 1781and remained with the church for 45 years. When the South Parish was divided in 1826 creating the new West Parish, Paul and Elizabeth were charter members, #4 and #5 respectively, of the new West Parish Church on Dec. 5, 1826. Paul Hunt pledged a ½ share of $50. toward the building of the church. Paul bought a ½ acre with all buildings on Mar. 24, 1788 for 75 pounds from John & Samuel Chandler. He then added a 19 acre 132 poles parcel for 60 pounds on Dec. 31, 1788 from Jonathan Abbot Jr. (deed recorded on Apr. 2, 1799). It was located on the west side of the road leading from Zebadiah Abbot to Nehemiah Abbot Jr. (Lowell St.) An interesting notation is the parcel abuts a “Training Field”. [a pasture used for Militia training]. Paul acquired additional parcels; 4 acres 50 poles on Dec, 7, 1790 from Joseph Martin & son for 5 pounds, a 3 acre parcel across the street abutting the “burying ground” on Feb. 2, 1792 from Abiel Foster. Paul and son Paul Jr acquired, from David Chute, a 46 acres parcel for $633.40 on April 2, 1806. Son Paul Jr. would marry on Sept. 26, 1811 to Mary Butler Durant b. May 25, 1786 in Andover, dau. of Amos & Sarah Ballard. Paul Jr. was also a Cordwainer. Paul & Mary B. had six children; Edwin b. July 9, 1812, Isaac b. July 28, 1814, Amos b. Oct. 29, 1816, twins John W. & Mary Ballard b. Aug. 19, 1819 and Hannah Jane b. Oct. 20, 1821. 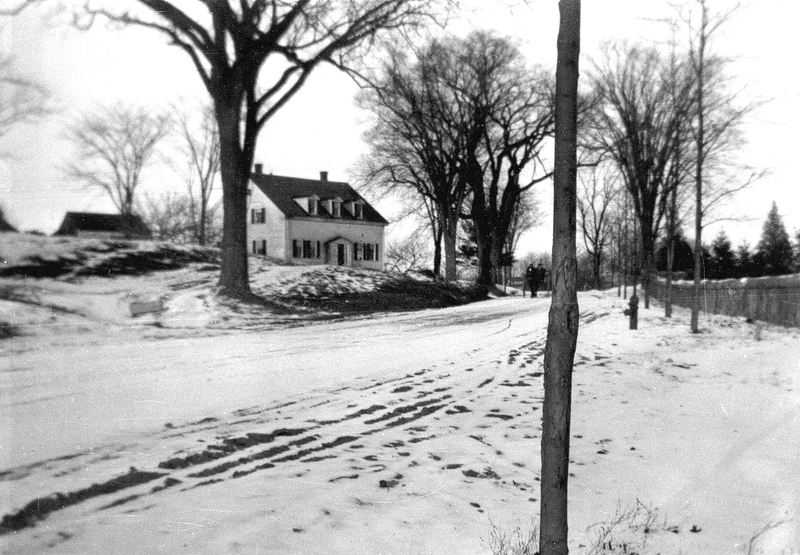 Paul Jr. had purchased a 1½ acre lot west of his father’s dwelling house on Oct. 16, 1805. We now know that this lot was the 221 Lowell St. property. The 1830 Andover map lists both houses marked J. Hunt. On June 8, 1819 Paul Jr. & wife Mary B. sell the 1 ½ acre lot with buildings for $500 to William Foster & Zebadiah Abbott. The sale also includes his undivided half share of the Daniel Chute farm purchased in 1806 with his father, a portion of which had been sold to Herman Abbot. Foster & Abbott then sell the property to Timothy Ballard 1½ acre with dwelling house for $500 on June 19, 1819. That same day Elizabeth Hunt buys from Foster & Abbott 23 acres for $150, owning ½ undivided share, this, the other half of the Chute farm. Paul Hunt Sr. then buys 1 ½ acre house & lot back on May 23, 1820. The Hunt farm now is 100 acres. Sadly Paul Jr. died on Oct. 15, 1826 at age 43. Leaving his widow Mary B. and six children ages 5 to14. His father Paul died five years later on Nov. 28, 1831 age 78 years. Paul Sr. died intestate and the courts appoint Solomon Holt Administrator of his estate in April 1832. The property is sold at auction on May 3, 1832 to pay off debts of $1600. Edward R. Dike, a Cordwainer, buys a portion of the property and the “deceased Dwelling House & 1acre 48 rods” and the woodland lot across the street for $498.03. Dike then sells to Nathan Abbott 4th on May 4. 1832. Nathan Abbott would later be known as Nathan 2nd. Some deeds list as Nathan Abbott 3rd. He later sells the home at 221 Lowell St. to John Nourse in 1844. Solomon Holt sells a part of the real estate to Elizabeth Hunt, single woman for $815.62. This Elizabeth Hunt is Paul Sr. sister and not his widow Elizabeth (Shattuck) who died on Nov. 12, 1837. The deed included a second parcel across the street that abuts the burying ground. This parcel is the home at 215 Lowell St. The 1850 Andover Valuation assessment for Elizabeth Hunt lists; House $450, barn $75, 55 acre farm $1210. Her Farm stock $64 and she had $200 in cash. The Federal census of 1850 lists Elizabeth Hunt, 60, her cousin Elizabeth Shattuck 47, [daughter of her mother’s brother William & Abigail (Foster) Shattuck] Also living in the house is Nathan Abbott 2nd age 51, Farmer & Sarah Durgin 27 NH, boarder. Perhaps Nathan supervised her farm. 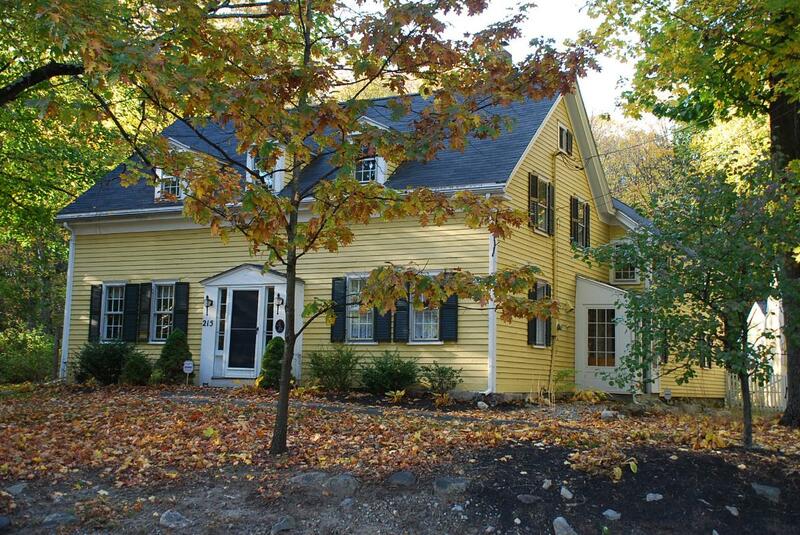 His holdings in 1850 included 210 acres in 12 parcels, a carriage house $60, farm stock $178 and 2 shares in the Chelmsford Co. Nathan would live out his days at the Hunt home. In 1860 lists Nathan Abbott 2nd, 60, farmer, Elizabeth Hunt, 70, farmer, Elizabeth Shattuck 67, a servant, Ann Wardwell dressmaker and Patrick Murphy 20, an Irish farm laborer. The 1870 census lists Eliz. Hunt 80, Eliz. Shattuck 67, Tailoress, and Nathan Abbott 2nd 70, as boarding. Nathan died on October 29, 1870. He was born July 5, 1799 son of David & Priscilla (Chandler) Abbott. Interred at West Parish. Cousin Elizabeth Shattuck died of Consumption on Feb. 12, 1875. Elizabeth Hunt died three years later on Jan. 1, 1878 and the property was inherited and sold by the Hunt heirs; John W. Hunt, of Merrimac, MA, Isaac Hunt of Lawrence, Amos Hunt of Haverhill, Mary B. & Hannah Jane Hunt of Andover. 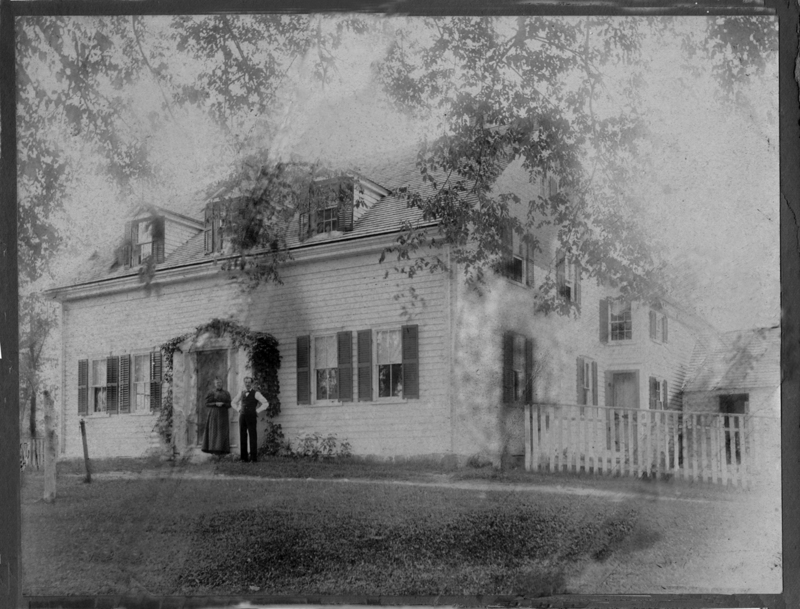 Charles H. & Robina Littlefield of Kennebunk, Maine purchased the property on April 10, 1878 for $3500. Two years later Mary Ballard Hunt purchased the homestead back on Jan 3, 1880 at the same price. The 1880 federal census lists Isaac & Beulah F. Hunt, daughter Sarah M. Wagstaff, a widow, and Mary B. Hunt, both dressmakers. Mary B. and Hannah J. Hunt were Isaac’s sisters. Isaac born July 28, 1814, son of Paul Jr. and Mary B. (Durant) married on Oct. 8, 1840 to Sarah Center Worthy. They had three children; Sarah Maria b. Oct. 13, 1842, Sewall Paul b. Jan. 19, 1845-June 26, 1847, and Moses Edwin b. May 28, 1847. Wife Sarah died July 26, 1847 at age 26. Isaac remarried on Sept. 21, 1848 to Beulah Frost b. 1816. Isaac & Beulah had two children James William b. May 1850 and Isaac b. 1854. Isaac died on May 17, 1884 of Apoplexy age 69y 10m. Hannah Jane Hunt died the following year on May 10, 1885. Mary B. Hunt lived another ten years and died on May 31, 1895 at 75y 9m 12d of liver cancer. 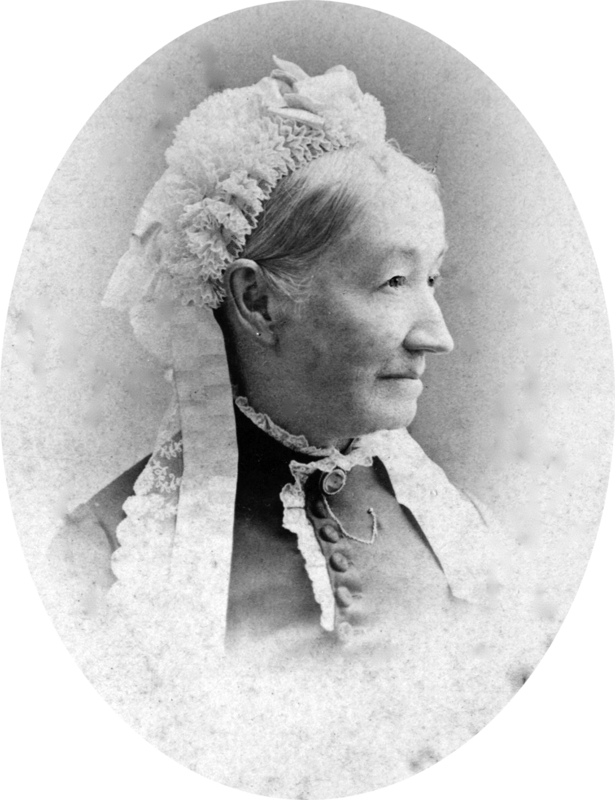 Her niece Sarah M. (Hunt) Wagstaff inherited by Probate will on July 15, 1895. Sarah, daughter of Isaac & Sarah W. Hunt, married Dec. 7, 1865 in North Andover to John Wagstaff Jr. b. 1841 in England, son of John & Jane Wagstaff. John was a tinsmith and machinist who drowned at age 30 in a boating accident in North Andover on June 5, 1871. Sarah later returned to the family homestead with her father and step mother Beulah. Sarah was an active member of the Baptist Church in Andover. Her half-brother James William Hunt had married on Jan. 30, 1871 to Ida Augusta Mears, dau. of Moses & Rebecca Mears. They had three children who did not survive. Ida died of Consumption on Oct. 3, 1888. James would live with Beulah and Sarah. Beulah died Dec. 20, 1909. Sarah sold the small parcel of land across the street from the house to William M. Wood in 1908 for the expansion of the cemetery grounds. Sarah, in ill health sold the homestead in June 1934 and died on October 24, 1934. She is interred at West Parish Cemetery with the Hunt family. Her brother James moved to Tewksbury and died in 1935. The property was sold to Evangeline Frost Powell on June 13, 1934, who later was declared insane and the property came under the guardianship of Mildred L. Blakesley who sold the estate March 11, 1954 to William & Lorraine A. MacKenzie. Bill MacKenzie worked for Western Electric in No. Andover and was an avid golfer and member at the Andover Country Club. Lorraine was a creative decorator and they restored the house during their years of ownership. The remaining English style barn behind the house, of three bays with center door on the side wall, was similar to the barn of the Amos Blanchard House now the Andover Historical Society. The barn was razed about 1962 and later an in-ground swimming pool occupied the site by 1966. Lorraine established a woman's shoe shop "The Shoe Tree" in the mid 1960's at Old Andover Village. The shop soon moved across to the corner store at 98 Main St.. A second store called "The Branch" opened on Cabot St. in Beverly, MA about 1969. Lorraine had one daughter Aimee Oliver, AHS 1963. Their marriage ended and after both had remarried, the house was sold to David H. & Louise (Moore) Batchelder on May 21, 1976. 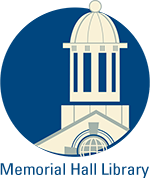 David and Louise, both Andover natives, had three daughters, Wanda, Beth and Trudie. They lived on Old County Rd. prior to moving here. David first worked as a fireman in Andover but left for health reasons. He later became the Town Assessor for Belmont and Burlington. Louise worked for several years as a secretary in the admistration offices of the Andover School Department. They were active members of the Andover Elks. In the 1980’s they established an Assessing company and did revaluations for local towns & properties. They continued restoration of the house, updating the kitchen, bathrooms and built the garage. David’s brother S. Abbott Batchelder, a carpenter, built the garage. After retirement they moved to Danville, VT and sold to the current owners Stephen D. & Carole J. (C.J.) Sawin on Nov. 21, 1996. The Sawins have done major restoration to the property, replacing rotting sills, re-pointed the foundation, and razed the rear screen porch, added by McKenzie, to build a large family room. They remodeled the kitchen and apartment in the ell. The pool area, (removed by the Batchelder's in the 1990's) has been terraced and landscaped. Steve is an active member of West Parish Church and served as a board member of the West Parish Garden Cemetery. Steve and CJ volunteer their time at the Children’s Garden activities and Lantern festival in the cemetery. They have two children, Mathew Dixon Sawin of Culver City, CA and daughter Lisa Danielle Sawin, AHS Class of 1999. Paul Hunt – Mar. 24, 1788 - b. 149 leaf 27 – (75 pounds) - ½ acre w/all blds. Timothy Ballard - June 19, 1819 rec. July 2,- b. 223 p.1 - 1½ A w/dwelling house $500. Paul Hunt - May 18, 1820 - b. 223 leaf 290 - 1½ A w/dwelling house $500. Acreage 16,520 sq. ft. approximate frontage 140'.